Crock Pot Chicken Enchiladas - Recipes That Crock! 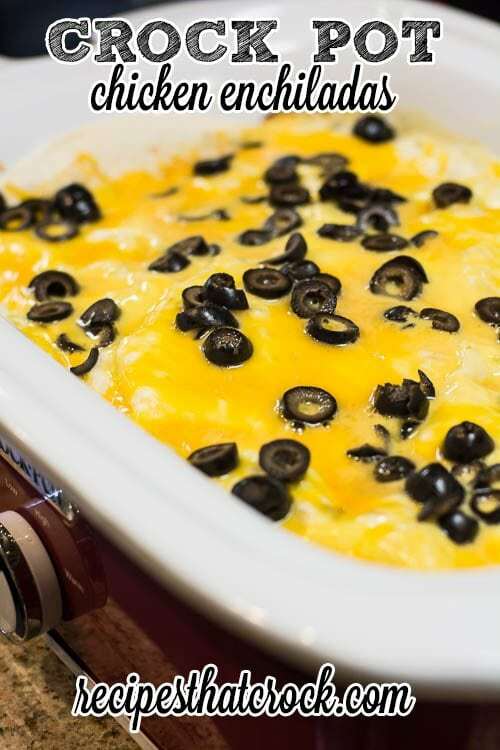 This recipe for Crock Pot Chicken Enchiladas takes one of our tried and true favorite casseroles and converts it into one of our favorite easy crock pot recipes! We have made some version of these Chicken Enchiladas regularly for the last 15 years… ever since a family friend introduced us to them! However, it was only recently that I converted it into a crock pot recipe. Truth be told, I have been wanting to try it ever since I got my casserole crock. And, after I converted our Chili Cheese Casserole into a crock pot recipe, I knew I had to try it! Now I could call this recipe a double crock pot recipe as the cooked chicken I used in this recipe is actually from our favorite crock pot shredded chicken recipe. You don’t have to use that recipe to cook your chicken, any cooked chicken will work, however, we pretty much always keep it on hand, so that is what I tend to use. You start by making your sauce and then spooning just enough on the bottom of your pan to keep your tortillas from sticking. Then you layer your tortillas, sauce, chicken, cheese, olives and repeat. In my casserole crock I made three layers because it was spread out. In a oval or circle crock pot, you may want to make additional layers. My casserole was nice and bubbly around 2 hours on high. But, I would begin checking on it around 1 1/2 hours. Mix together enchilada sauce and sour cream. Spread a very thin layer of the mixture on the bottom of the crock. (Layer Begins) Spread 4 tortillas on the bottom of the crock. Spoon a generous layer of sauce on top of tortillas. Top with last 4 tortillas and cover with remaining sauce, cheese and olives. Cover and cook on high for 1 1/2 to 3 hours until cheese and sauce is nice and bubbly. Hi Cris – what else have you used your casserole crock for besides this and the Chili-Cheese Casserole? Hi Shelia- We will be doing a post recapping a lot of the recipes we have tried. We have done both regular and Mexican lasagnas and the Blueberry Breakfast Casserole in addition to the enchiladas and the Chili Cheese Casserole.